She wanted to take home a pair of genuine alligator shoes, but was very reluctant to pay the high prices the local vendors were asking for. Later in the day, as the shopkeeper was driving home, he spotted the same young woman standing waist deep in the murky water, with a gun in hand. As he brought his car to a stop, he saw a huge 9-foot gator swimming rapidly toward her. Nearby were seven more dead alligators, all lying belly up. The shopkeeper stood on the bank, watching in silent amazement. 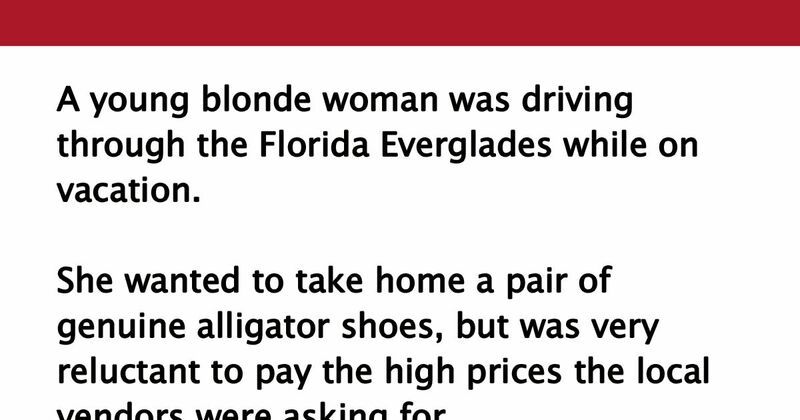 The blonde struggled mightily, but managed to flip the gator onto its back. Rolling her eyes heavenward, she screamed in frustration, "DAMN IT! THIS ONE'S BAREFOOT, TOO!" LOL! I don't think that's how you get alligator shoes! SHARE if you enjoyed this one!